E-Zee Heat Seal 4220 5 mil. is a transparent nylon film. It has heat-activated adhesive on both sides. A special release paper is on one side to allow for pressing. It is a highly bondable heat seal used primarily on the back side of badges that will be permanently sealed to garments or hats. It adheres well to acetate, silk, cotton, rayon and wool. It provides exceptional dry cleaning resistance and excellent wash-ability. Made of nylon (polyamide). Hoop fabric, crinoline and/or stabilizer. Embroider design and un-hoop. Lay a piece of E-Zee Heat Seal on the back side of the embroidery with the release paper facing up. 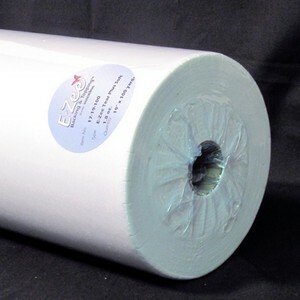 Use a heat press or iron to bond the E-Zee Heat Seal to the fabric (see chart below). Allow to cool and then pull off the release paper. Cut the patch to shape with scissors or a die cutter. Finish the edges with a serging machine or a zigzag stitch on a home sewing machine. Please note: The recommended heat setting for the garment or substrate must be taken into account when setting the temperature of the iron or heat press for heat seals. Use a press cloth or silicone sheet as needed.